The way my husband loves BBQ sauce, is the way I feel about Franks RedHot Buffalo Sauce. Reading the ingredients on the bottle is a little misleading, but it is indeed vegan! Happy days! 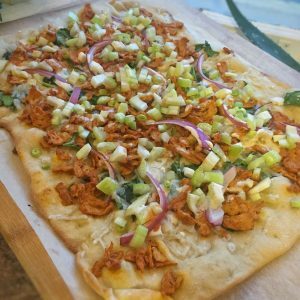 What would be better than a buffalo chicken pizza made vegan? The answer is nothing. In a skillet, heat up the olive oil and add in the vegan chicken, paprika, onion powder, salt, garlic powder, and black pepper. Cook for 4-5 minutes, stirring continuously. Add a ¼ cup of the buffalo sauce to the pan to coat all of the vegan chicken. Cook for another two minutes and then remove from the heat. Prepare baking sheet with either parchment paper or semolina flour and the pizza dough. Rub the vegan butter on the pizza dough, spreading it thinly, like you would do with a typical pizza sauce. Sprinkle the vegan cheese evenly over the pizza dough and butter. Evenly spread the spinach, vegan chicken, and onions over the pizza. Once the crust has turned golden brown, remove from the oven and top with green onions and celery. Drizzle the remaining buffalo sauce and vegan ranch over the pizza and enjoy!